Two Gander Farm is part of a 260 acre preserved farm that is owned by a land trust and located within the Philadelphia suburbs. Stewards will learn as part of an organization that has a broad mission of land stewardship and applied agroecology. We are a short distance from the SEPTA R5 line that is a direct access to center city Philadelphia. Our CSA community is a vibrant group with members that have volunteered to accompany stewards on outings to Philadelphia and the surrounding area. Stewards will be expected to integrate with the regular farm crew and will be part of the team that is regularly harvesting, cultivating, pruning, transplanting and seeding a variety of annual vegetables. Stewards will work a regular schedule of Monday through Friday with occasional opportunities to assist our farmer's market on Saturdays. Stewards will work closely with our harvesting and transplanting crew leaders as well as the general manager of production. Harvesting, transplanting, hand cultivation, pruning, and trellising. We are in zone 6b with variable weather patterns and much seasonal variation. PA is hot and humid in the summer with cool nights in the spring and fall. Our frost free growing season is typically Mid May to Mid October. 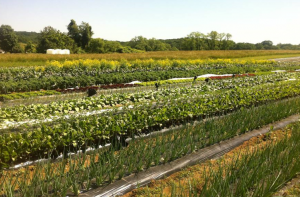 Our farm is semi-urban with easy access to Philadelphia as well as local recreation opportunities. $10/hour, Unlimited food from the farm. No meat or dairy available., Nearby housing to be determined: Steward may need to pay up to $200/mo. for rent. Local transport provided. Housing has been arranged on another local farm. We offer internet access while on farm with occasional access to a laptop or tablet if needed. We can offer use of the farm van or another vehicle for local errands.